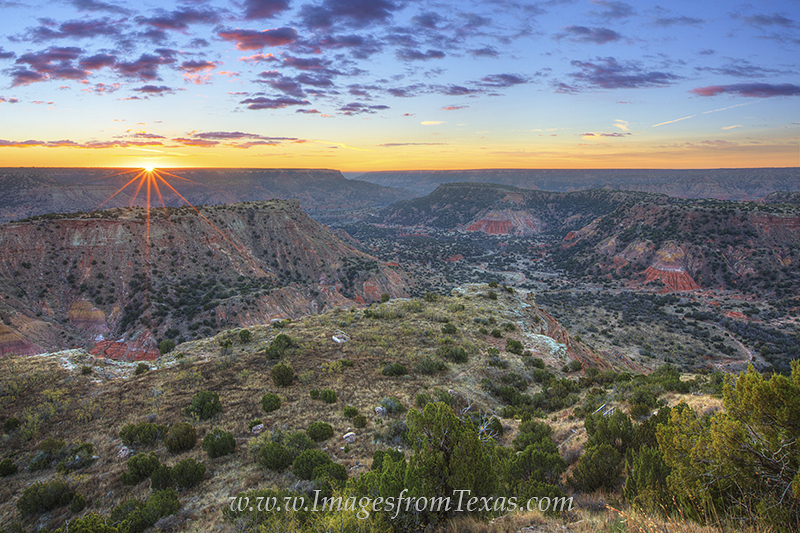 From the overlook at the visitor center at Palo Duro Canyon State Park, this is sunrise over the valley. The temperature on this November morning was 21 degrees. And my fingers were frozen as I stood at this location for 45 minutes, photographing the canyon and sky as the colors changed from a faint orange glow till this moment when the sun peeked over the distant rocks. Special thanks to the park ranger who allowed me access to this point (and to get through the gate) in order to capture this scene for several consecutive mornings (the entrance gate does not open until 8am). Photo © copyright by Rob Greebon.